MUNICH, Germany (FIBA Europe Cup) – There are just four teams remaining in the FIBA Europe Cup, following the completion of the home-and-away Quarter-Finals on Tuesday evening. A week after Telekom Baskets Bonn (GER), Nanterre 92 (FRA) and Telenet Oostende (BEL) confirmed their places in the Semi-Finals, Elan Chalon (FRA) have grabbed the last remaining spot, defeating Cibona 168-165 on aggregate score. 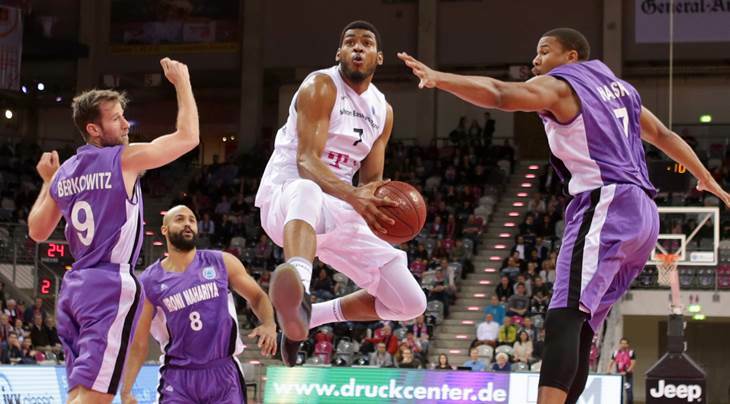 Telekom Baskets Bonn claimed their position by knocking out Ironi Nahariya 169-158, and will now go up against Nanterre 92, who eased by Muratbey Usak Sportif 192-167. On the other side of the draw, Telenet Oostende took down last year’s Semi-Finalists BC Enisey 167-163, setting up their clash with Elan Chalon, who incidentally also made it as far as the Semi-Finals in 2016. The Semi-Finals, and subsequent Finals, will also adhere to a home-and-away format. In the Semi-Finals, home court advantage for the return legs is with Telekom Baskets Bonn and Elan Chalon. The first leg of the Semi-Finals is scheduled for March 29, with the return leg on April 5.